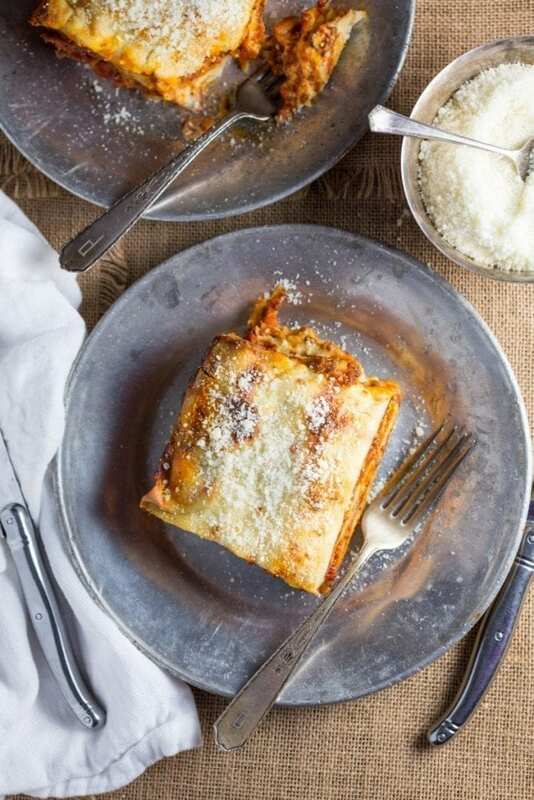 With a crunchy top and a creamy center, Lasagna Bolognese is the king of baked pastas. Our version adds fontina cheese to the béchamel with adds to the earthy richness. Before we get into this week’s recipe, I want to make a clarification about last week’s post: the chocolate babka. 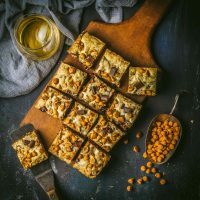 You might remember that one of us (okay, it was me) declared it to be an excellent treat for either Easter or Passover, whichever was your preference. We were inundated with literally several letters pointing out that the babka is yeasted, and a traditional Passover, one might say, tends to skew towards the unleavened. The Hebrews fleeing Egypt weren’t, after all, told “Take what you have and scarper, there’s no time to let your bread rise, oh, unless you’re making babka or something, that would be awesome, oh, good work on the pyramids btw”. So, my apologies for that slip, and please tell Uncle Mort it won’t happen again. 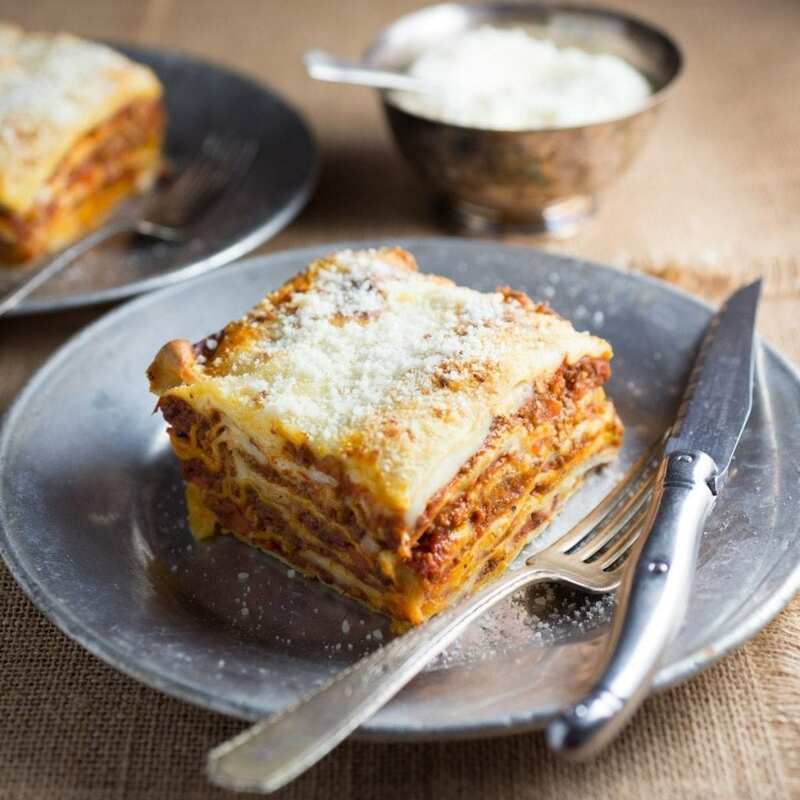 This week’s dish is so much recipe – very so much recipe, wow – we actually had to enlist the help of a third Nerd, our most excellent and game friend Heather, who stayed with us this weekend and whose initial idea it was to make lasagna. 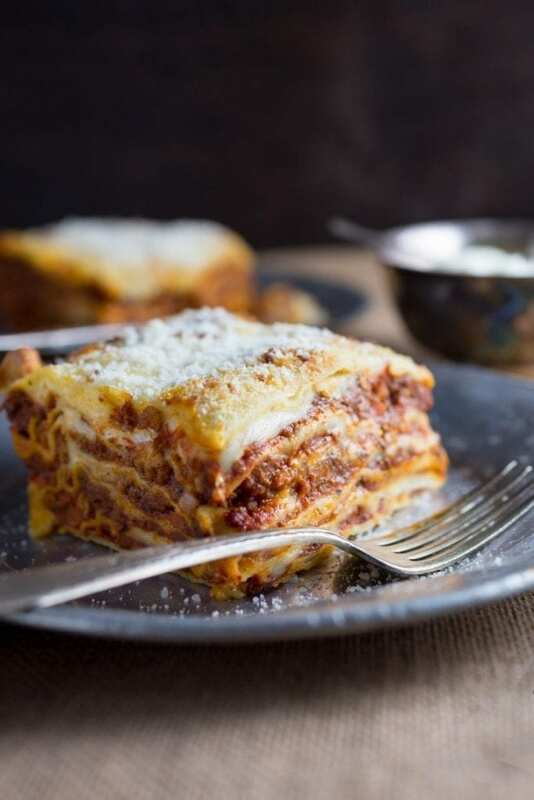 Now, I made lasagna at uni – I think we all did – and it’s the easiest thing imaginable, you buy your jar of Ragu and a good cheap packet of dried lasagna, bit of cheese of some kind, Double Gloucester probably, cheddar will do at a pinch, bit of milk, nutmeg, there you have it, one lasagna, lovely. (That sound you hear is Emily retching and then fainting). Yeah, but no. Lasagna bolognese from scratch. Like, making the pasta and everything. Oh, that changes the game a bit, not quite so cocky now, are we, Mr Lasagna Expert? Fortunately, a couple of years ago Emily and I had taken a pasta-making class with Jennifer Clair’s Home Cooking school when she was running classes here in Beacon, and lasagna noodles is basically the first thing you make (before you cut the dough down into strips for linguine or fettucine, or into ravioli squares, which we totally did, you guys). 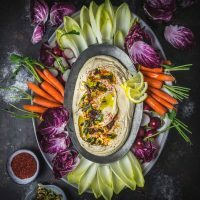 As we often do, we turned to the wisdom of internet (specifically, Smitten Kitchen, Anne Burrell and Bon Appétit) for the recipe, taking the best parts of each, as well as simplifying and putting our own spin on it. That meant that we could spend at least part of the Easter weekend down at our local farm education center watching sheep in labor, and of course, scoffing chocolate, and not be chained to the hot oven. The pasta dough is actually really easy – it’s just flour, salt, and eggs. (Speaking of eggs, there’ll be an update shortly on the hens and the beautiful eggs they’ve been laying for us.) You can do it by hand, but it’s easiest to mix it all up in a food processor and let it sit, covered, for an hour. Add a little water if you need to (a couple of tablespoons at most), to get the dough coming together, but don’t overdo it else you’ll need to add more flour to the dough afterwards. You’ll notice that this recipe (and all traditional Lasagna Bolognese recipes) contains no mozzarella or ricotta. It doesn’t need it because the béchamel is so rich and creamy, but we decided to throw out the rulebook (or really just set it aside for a minute) and add Fontina cheese to our béchamel. Fontina is an Italian cow’s milk cheese and it has a silky, rich funkiness that I love, especially when melted. It doesn’t take over but it adds a little extra creamy oomph (technical term) to the dish that we all went bananas for. Another controversial element of this recipe; we do not boil our fresh pasta noodles. We rolled them quite thin and there was enough moisture in the bolognese sauce to cook them while the lasagna bakes. This saves a major step since the noodles have to be boiled individually and then iced to keep them from over cooking, and then oiled to keep them from sticking together. Our bolognese is just a little bit more tomato-ey than some. This is in order to give the sauce extra liquid to help cook those noodles. The sauce shouldn’t be watery, but it won’t be just meat with a little tomato essence added. We made the entire lasagna bolognese in one day but it’s much easier to break it up into two. Make the bolognese on day 1. Let it sit overnight in the refrigerator. Then on day 2, make the pasta and béchamel, assemble and bake. You could also assemble the lasagna and refrigerate it for a day and bake it off when you’re ready. Combine the vegetables and garlic in a processor and mix until they’re finely chopped (just a few pulses should do it). Heat a large Dutch oven or saucepan on the stovetop, add the oil, and once hot, add the vegetables and season with salt and pepper to taste. Cook until soft and starting to brown a bit. (10-15 minutes). Add the pork and beef (and pancetta or bacon, if using) and cook until brown. Scrape the bottom of the pan with a spoon as you stir if it's getting dark. (15 mins). Stir in the tomato paste and cook for another few minutes. Add the liquid ingredients - red wine first, allowing to reduce for a few minutes, then add the tomatoes, milk and stock. Add the bay leaves. Simmer the sauce, uncovered, for 2 - 3 hours, stirring occasionally. You may need to add more chicken stock (or water) if the sauce starts to get too dry. When it’s done, fish out the bay leaves and leave to cool for 20 minutes (refrigerate when cool if assembling lasagna the next day). For the lasagna noodles (if you’re making it yourself). Combine the flour, eggs and salt in a food processor. (You can do this by hand if you’re feeling enthusiastic!). Mix until it starts to come together (test it with your hands). If it doesn’t stick, add a little water (just a couple of teaspoons at a time). Remove from the processor and work it into a ball on a floured surface. Let rest for an hour under a bowl or in cling wrap at room temperature. 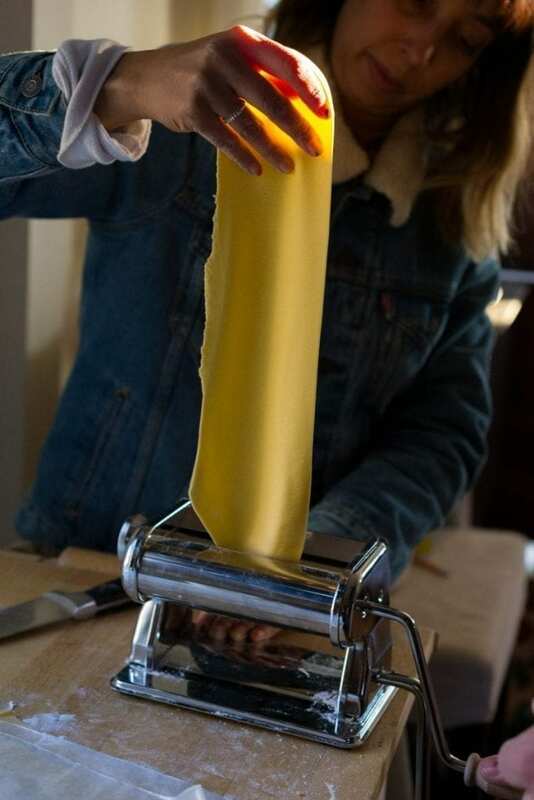 Once it’s rested, separate into several equal pieces (about ½ cup each) and run them through your pasta roller. Start with the widest setting, running through at least a couple of times, before moving to the next level. When starting out, it’s better to work the dough through a few times on the widest setting (0 or 1). Run it through once, then refold the dough, turn it 90 degrees, and run it through again. Repeat a few times, and then just run it through at this setting without folding. You should start to feel the dough turning “plastic” and smooth. Once you get to this stage, move the rollers together one level and run it through again. You can add a little flour if the strip is sticking to the roller too much. Repeat a couple of times at each level before moving down to the next. Don’t be tempted to skip levels! We stopped at level 6 (out of 9) but your preference, expertise, and machine may vary. Stack the noodles between floured wax paper when you’ve made more than you can fit on your countertop. On medium heat, melt butter in a medium saucepan. Add the flour, stir and cook for a minute. Add ¼ cup of the milk in a slow drizzle, whisking constantly until smooth. Add another ¼ cup and whisk until smooth. Then add the rest and whisk again. Add the salt, garlic, nutmeg and few grinds of black pepper, bring the mixture to a lower simmer and cook, stirring frequently, for 5 minutes. Turn off heat and stir in fontina, a handful at a time, until melted (if it doesn't fully melt, turn on low heat and stir until just melted and smooth). Taste and adjust seasonings if needed. In a 9×13-inch rectangular baking dish, spread ¼ cup of the béchamel (to keep noodles from sticking to the bottom). Add the first pasta layer, cutting pieces as needed to fill the dish. Ladle 1 generous cup bolognese sauce over the noodles, spreading it evenly. Drizzle ½ cup béchamel over the bolognese (don't worry about smoothing it out) . Sprinkle the layer with ⅓ cup parmesan cheese. Repeat this process (pasta, bolognese, béchamel, parmesan) until the dish is filled (you might get 4 or 5 layers) and end with a layer of pasta. Spread over a ¼ cup of the béchamel(or whatever you have left) and sprinkle ⅓ cup parmesan. Bake for around 40 minutes until bubbly and browned on top. Let t sit for at least 10 minutes before cutting. Serve with salad straight out of a box because honestly, you’ll be too exhausted to make anything else. And wine. Lots of wine. Note: Since there are several major components of this recipe, you might want to cook the sauce the day before you make the pasta and béchamel. If you do, refrigerate the sauce overnight (once it’s cool). The next day, warm it up slowly (it doesn't need to be hot, just warm). 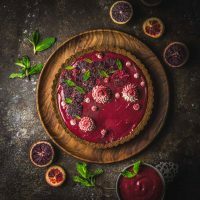 If you decide to make everything on one day, you will very likely need a couple of helpers (one person can start prepping the sauce while you make dough, and the dough can rest while the sauce simmers). The best lasagna bolognese I’ve ever had. I love that you made your own pasta for this lasagna, i bet it tasted so much more delicious! I haven’t made pasta before but you make it look so easy that I have to try. It really is pretty easy and the dough is very forgiving. I always think of it as a big deal but it’s really not. You should totally try it! Hello! Thanks for posting this! 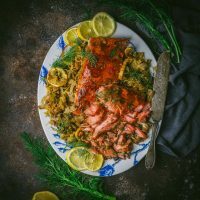 I have been making a ton of your recipes, and they have all been amazing! This one in particular was such a fun way to spend a not so lazy Sunday. I assembled it today and I am excited to bake it and try it tomorrow evening. One quick note on this one though, I noticed that Parmesan was missing from the ingredients list. I was lucky enough to have it, but I thought you might want to add it. I hope you keep up this amazing work!! Thanks so much for the compliment and for pointing out the omission! I just fixed it but I’m SO glad you had parmesan so it didn’t mess up your lasagna. It’s such a complicated recipe to write that I completely missed it when I proofread it. Yes, I have had Smitten’s homemade lasagna bolognese recipe in my “projects for someday” folder for a long time – and I still totally wanna do it at some point. This is inspiring! And that long-noodle shot is gorgeous! Thank you! Yes, it’s a project but it’s SO worth it. It’s totally do-able, especially if you break it up into two days. And the leftovers…so good. You won’t regret it. This is a beautiful post, visually. I am making it tonight, with mushroom bolognese, as we are pescatarians in our house! Thank you so much! I love the idea of the mushroom bolognese. Let me know how it turns out if you give it a try! Made this for my husband’s birthday dinner since I lost my old recipe. Took 2 days to make and had to enlist help when making the pasta sheets, as it takes extra hands. Everyone raved about this lasagne and said it was the best I’ve ever made! I am making it the second time now. Lasagna is my son’s favorite and he used to eat it before when his father was cooking for him. Since our divorce, my son was missing his lasagna. Since they are a good Italian cook, it’s hard to impress my son since he idolized his papi for his recipe. I ran onto this page and found this last week. Gladly, my 9 year old son likes it and asking me to do it again. My goodness, he was the only one eating the lasagna for 2 days and he was asking for it again. Thank you so much for sharing us your recipe. I am so grateful and I will always be doing this from now on. I’m making this tonight and tomorrow. The sauce is on the stove now and smells amazing! Quick question. How do you cut the lasagna and get it out of the pan, so it stays together? Lasagna generally comes out a jumbled mess. I’m a decent cook, but I’ve never figured this trick out. Hi Katrina! It is a little tricky, and if the bolognese is particularly saucy, it can get gloopy and hard to get out of the pan. We did find that the ratios we used were pretty good, so it didn’t end up too messy. We were able to cut down into the pan with a large knife, make squares, and then lift the portion out with a metal spatula. You might have to sacrifice the good looks of the first slice so the others will be easier to get out! Good luck! Thanks. One more question. This recipe was so delicious, we are already planning a day to try it again. My cheese sauce was really runny (only slightly thicker than milk). From the pictures you posted, your sauce seems to have a much thicker consistency. Any ideas on what I might have done wrong? Hi Katrina, the only think I can think of is that maybe the béchamel didn’t cook long enough at a simmer. Flour need to be brought to a full boil in order to release it’s thickening power so if the mixture didn’t get hot enough, it might not fully thicken. If it happens again (or for any flour thickened sauce), you can use some Beurre manié. This is just equal parts butter and flour mixed together, that can be added while a sauce is simmering. Start with just a teaspoon or two and add until the consistency is where you want it. I’d also consider the prospect that the poster didn’t use whole milk but lower-fat. How many lasagna noodles would you need if you don’t want to make your own? And, would you cook them first or layer them dry? Hi Cheryl, If you can find fresh lasagna noodles, that would be the best option because those don’t have to be pre-cooked. If you use dry, I do recommend cooking them a bit because they’ll soak up too much of your sauce otherwise. We used about 3-4 noodles per layer and had about 5 or 6 layers, I think. Looks amazing, going to make for a party but will need to omit the wine, what do you suggest to replace it? Hi Tracy, You can use more stock or water, and about a half tablespoon of red wine vinegar. Could this be made a day in advance so it can just be popped in the oven the next day? Yes, it works perfectly made a day or even 2 in advance.